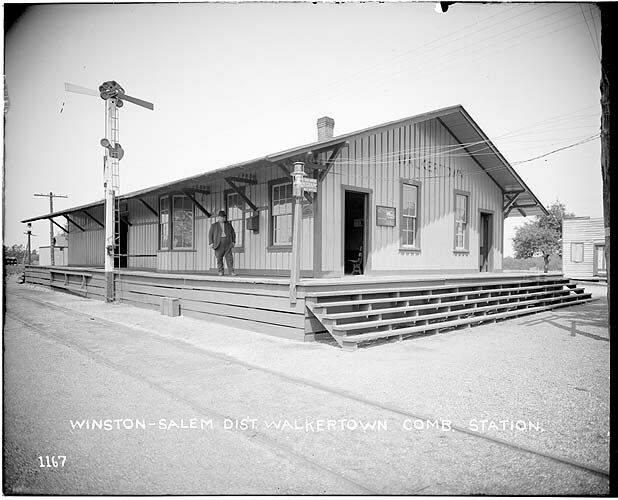 The mission of the Walkertown Area Historical Society, Inc. is to research, organize and preserve the history of Walkertown, North Carolina and the surrounding areas. This society will seek to communicate the story of Walkertown's rich history. Meetings are open to anyone interested in attending. WAHS thanks the following business for their support through membership. Click on the name to visit their websites. First Monday of every month, 2 - 5 pm. Stop by! Everyone is welcome. You do not have to be a member to attend. 2969 Main St, Walkertown, NC 27051. Our area newspapers have chronicled local events for nearly 200 years! . Come and hear tales about the grand old days of journalism! Also learn how to access great stories of yesteryear and today! Everyone is welcome to see how our free press documents our history! 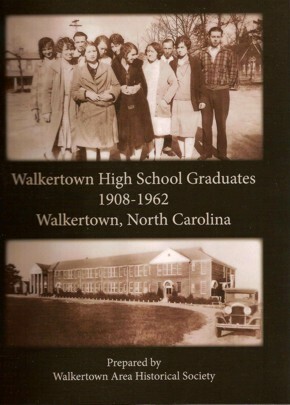 The Walkertown High School book is still available! Grab this piece of history while you can! Cost is $25 per book. If mailed, shipping cost is $7.50 for one book. You may purchase one in Walkertown at Webster Brothers' Hardware or Treasures in the Attic Home Decor. Both businesses are located on Hwy 66 in Walkertown. They are also available at the WAHS Open Houses the first Monday of every month, 2-5 pm, 3058 Church St and at our regular membership meetings. Please include your name, shipping address, phone number and email address with your order. 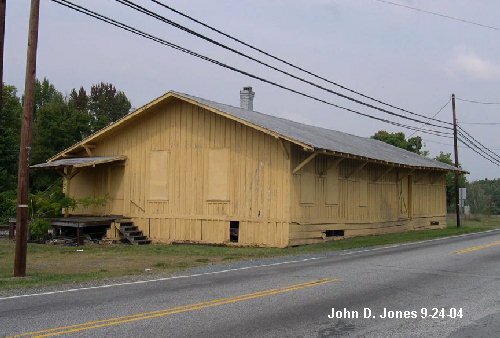 Help save our historic depot! A major part of Walkertown's past will vanish without it! On Sunday, April 27th, Preserve Historic Forsyth (PHF) Inc., a nonprofit membership organization founded in 2007 to provide a citizen voice for historic preservation in the county, held its annual membership meeting in Walkertown. With clear skies and temperatures in the 80s, the weather was perfect for the event. Click on link to newsletter below to read more. Have you ever noticed that the ceilings of the large porches on many old southern homes are painted a soft blue-green? In fact, it’s a color often referred to by old-timers as “Haint Blue.” Haint is a variation of the word “haunt,” and the color got its name from the belief that it could ward off any haints that might be lurking around the house. For those who are not steeped in the lexicon of the paranormal, haints are lost souls, or the restless spirits of the dead. And it seems that even Walkertown might have a few of them. While writing the pictorial history of Walkertown published by Arcadia Press, some of the authors were told about houses in and around town that were, well, they were haunted. That led to the idea of doing a book on Haunted Walkertown and work is underway to compile these stories for future publication. If you have any spooky tales of your own you would like to contribute, let us know by email (walkertownlore@aol.com), or by phone: 336-416-1968. Don’t forget to provide your contact information. Walkertown History in the News! On August 13, 2012, Wallace Baird, an original founder of the Walkertown Area Historical Society, gave Fox 8 News an historical tour of Walkertown. 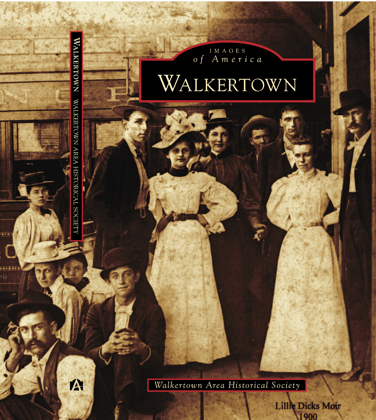 Our new Walkertown pictorial book features 200 photos of Walkertown people, places and artifacts documenting the Walkertown area's history. 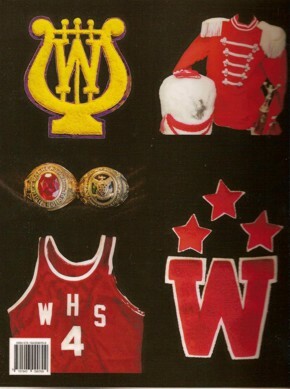 You may order your book now by emailing us at WAHSfunds@gmail.com or calling 336-497-1516. Cost is $22 per book. If mailed, shipping cost is $3 for one book. They will be available at the WAHS Open Houses the first Monday of every month, 2-5 pm, 3058 Church St.
WAHS greatly appreciates the hard work and long hours put in by the Book Team (Libby Adams, Ann & Tom Hamilton, Wayne Biby, Nancy Farnham, Jane Morris, Jean Maxcy Linville, Sarah Welch, Wallace Baird and Susan Miller) and the generosity of individuals who allowed us to use their photos. This book will be a beautiful addition to your library and a source of reference for your family. The number of books on hand will be limited so get yours soon! Looking for an opportunity to get involved? We need volunteers in all areas - fundraising, public relations, archives, membership, website, grounds and general support. We are searching for information, photographs, sites and artifacts to document and share. If you are interested, you may email us at WalkertownHistory@gmail.com. The State Library of North Carolina and the State Archives looking for records in family Bibles. The library and archives are especially interested in Bibles that include records with dates before 1913. That's because a statewide vital records law took effect that year, meaning that previous to 1913, family records were the best way to keep track of births, deaths, marriages and other important dates. The two agencies have created a digital collection called North Carolina Family Records online, which transcribes and digitizes nearly 220 family Bible records and the six-volume "Marriage and Death Notices from Raleigh Register and North Carolina State Gazeteer: 1799-1893." Anyone interested in donating Bible records should contact Druscie Simpson at Druscie.Simpson@ncdcr.gov. All members may attend meetings of the Board of Directors. We normally meet on the second Tuesday of every month at 5 pm, 3058 Church Street. 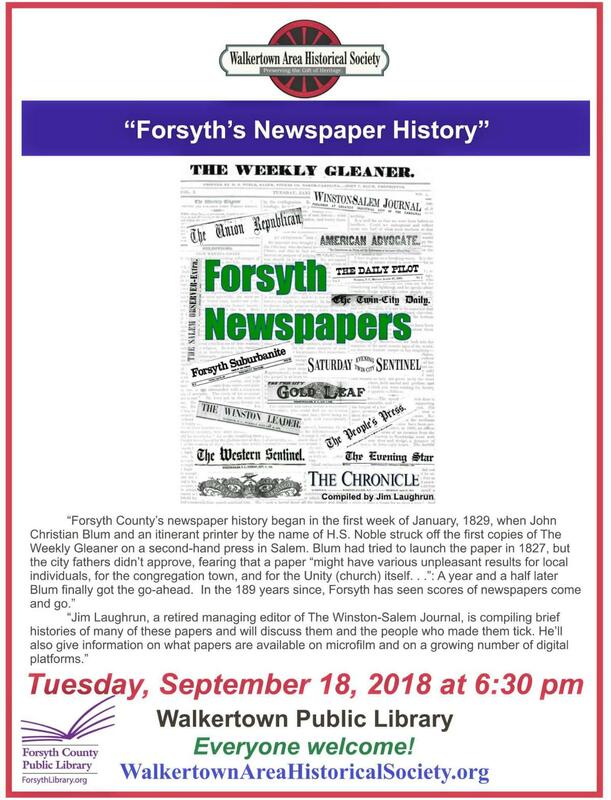 Email WalkertownHistory@gmail.com or call 336-497-1183 for more information. 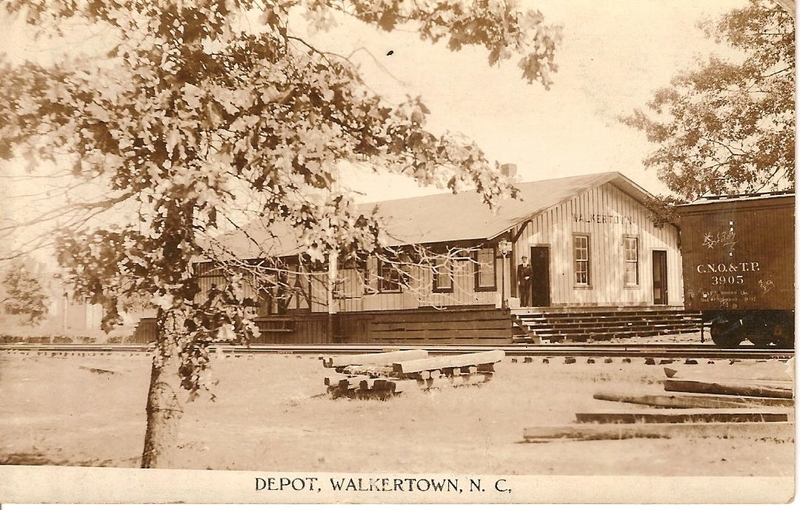 Send website comment/suggestions to WalkertownHistory@gmail.com. 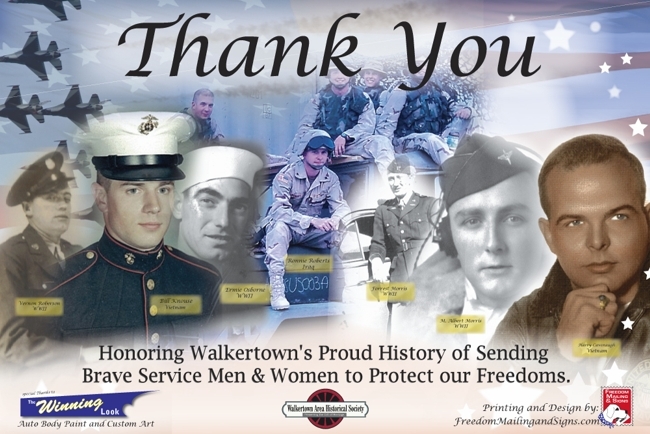 The Walkertown Area Historical Society, Inc. is a non-profit corporation chartered by the State of North Carolina and is a tax exempt public charity under section 501 (c) (3) of the Internal Revenue Code. Contributions received are deductible under section 170 of the Code. The Society is qualified to receive tax deductible bequests, devises, transfers or gifts under section 2055, 2016 or 2522 of the Code.